The Connecting European Dynamic Achievers Role Models (CEDAR) Network Launch Event and European Muslim Women of Influence Gala took place in Madrid, Spain on 30th October 2010 in celebration of the European Muslim Women of Influence finalists and The Connecting European Dynamic Achievers Role Models Network’s first major event. The conference and gala event was bring together entrepreneurs, media representatives, thought leaders, senior policy officials and politicians for an evening of debate, engagement and celebration. The Event were attended by high profile female business leaders especially Cherie Blair, (wife of Former Prime Minister Tony Blair), Ms Farah Pandith, Special Representative to Muslim Communities, US Department of State, Senior Advisor Communications, Dr Emmanuel, UN Alliance of Civilizations and Sasha Havlicek, Chief Executive Officer, Institute for Strategic Dialogue. Cherie gave an opening speech on her personal experiences of being female lawyer and breaking down barriers. 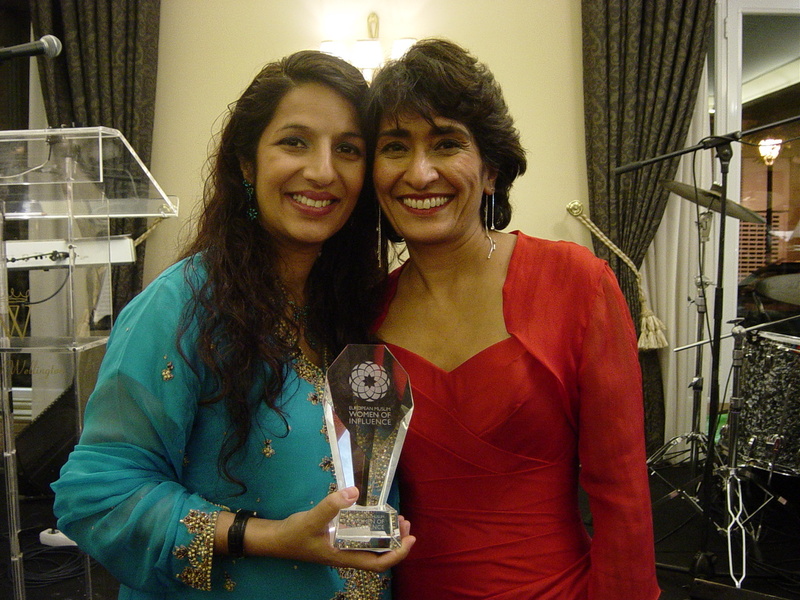 Razia Iqbal, Special Correspondent and presenter, BBC (pictured with Sabina, above) hosted the awards and announced 10 winners named on European Muslim Women of Influence List 2010. Sabina Iqbal is one of them, a deserving winner. The judges confirmed that although it was to difficult to choose the 10 winners from 26 finalists, all winners were chosen as a real role models for other, which fits in the heart of CEDAR Network. Sabina on receiving her award gave an moving and inspirational speech about her experience, her passion in empowering and motivating others to follow her footsteps. This resulted a standing ovation from the audience and many approached to Sabina to congratulate in her achievements.